The Boss man wins stage 4 of the Tour Down Under. Griepel rules. Alberto Contador admitted that despite 4 grand tour wins he’s not the boss of the peloton. At 38 years of age and back of a long retirement, Lance Armstrong isn’t the boss anymore. But ask anyone who the boss of the Tour Down Under is and the answer is unanimous: Andre Griepel. He proved it once again on stage 4 from Norwood to Goolwa with a convincing win over Robbie McEwen (Katyusha) and Graeme Brown (Rabobank). 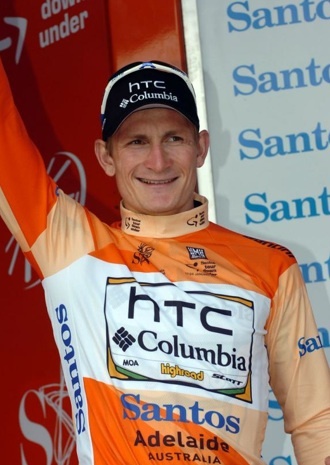 It was his third victory in this Tour Down Under after winning the event in 2008 and nearly winning in 2009 before a crash forced him out of the race. Between the brutal cross and headwinds and the dominance of Greipel’s HTC-Columbia team, all breakaways were hopeless and submission total. The German sprinter singled out the work of new signing Matthew Goss. “If you have riders like him then no one can pass us,” said Greipel. “We deserve the win because we always ride from the front.” Spoken like a true boss man. This is the Tour Down Under brought to you by Andre Greipel. The 25 knot gusts of wind blew away Alejandro (on borrowed time) Valverde’s chances for overall victory. The Spanish dropped from fourth overall down to 26th. He lost 17 seconds and Greipel’s time bonuses pushed the deficit to 41 seconds. The rocket from Rostock, Germany wins in the wind. The Boss man of the Tour Down Under has put his foot down again. « Griepel wins, no, Evans wins, no Valverde wins. No, wait… who?